It was a good weekend to be a Maroon. Even though they lost their final match of the regular season, the South Siders learned early Monday afternoon that their hard work this season would still be rewarded with an NCAA tournament berth. The Maroons (11–4–3) fell to No. 1 Wash U (17–1–0) 2–0 at home on Saturday. Despite the strong defensive fight the hosts put up, the visitors scored one goal in each half and finished undefeated in the UAA with a conference record of 7–0–0. Chicago finished third in the conference with a 3–2–2 record. Going into the matchup, the Maroons knew the Bears would be tough opponents, but they were determined to finish their season as strongly as possible. While both teams had a fair number of opportunities with eight shots each in the first half, it was Wash U that found the back of the net with a goal in the 23rd minute, taking a 1–0 lead. Though the first half featured fairly even play, the Bears took control in the second half with 13 shots to Chicago’s three. The visitors widened the gap with another goal in the 60th minute and held the Maroons scoreless to end the game with a 2–0 victory. Third-year goalkeeper Jacinda Reid was crucial to holding the Bears to just two goals. Reid played goal all but 13 minutes of the game and tallied six saves with two goals allowed. Though the team was not happy to end their season with a defeat, they felt they played well against a very strong opponent. Not only did Saturday’s game close out the South Siders’ regular season, but it was also Senior Day for nine fourth-years, the last home game of their careers. Though Chicago lost the game, it did not lose its third place spot in the UAA. No. 23 Carnegie also lost, missing its opportunity to leapfrog the Maroons, and finished in fourth place. Chicago received a Pool C berth to the NCAA tournament yesterday afternoon. 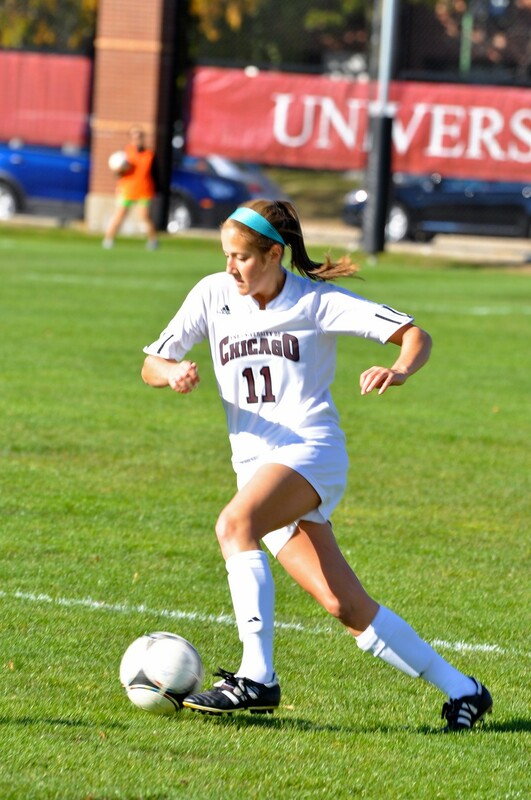 The Maroons will take on Capital (16–4–1) this Saturday at the first round of the tournament at UW–Whitewater. A few of Chicago’s familiar opponents made the tournament as well, with Emory, Carnegie, and Wash U also receiving bids. “It is exciting to be selected to compete in the NCAA Tournament, especially as a fourth-year. We have worked hard this year, and I think we are playing the best we have played all season. It also feels great to say that I started and ended my collegiate soccer career in the NCAA tournament,” said fourth-year captain Kelsey Peterson. “This season has been good,” Bittner said. “11–4–3 with one of the toughest schedules in the country is awesome.” The selection committee must have felt the same way.